Tips to Make Potty Training More Fun! Potty training is a journey that you and your child embark upon together. Some days will be filled with success, and others may have set backs and frustrations for everyone involved. It’s important to remember that potty training is a meandering journey, so don’t get hung up on the accidents. Even when it feels like your kid will never get the hang of it, breakthroughs might be right around the corner. You can make potty training fun for you and your toddler by incorporating some creative tips and ideas into your day – and help decrease stress for both of you too! Have a Potty Party! The last time you saw a diaper cake was probably at your baby shower – but now you can create a Pull-Ups® potty training cake to make your little one super excited about learning to use the potty. 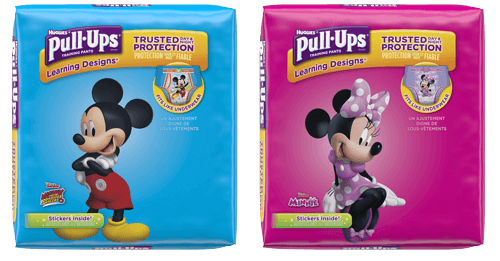 Roll up Pull-Ups® with your child’s favorite characters, bundle them together with ribbons, and let your child help you stack the Pull-Ups® into tiers. Top with a special toy or plush animal that can be your child’s potty partner and make this cake a centerpiece of your family dinner that night. Go for a (brief) shopping trip. Plan a short trip to a retail store where you can let your child pick out their own Pull-Ups® Training Pants with their favorite characters, patterned underpants, and a potty seat. Make sure to time the trip around your child’s naptime so they are happy and well rested. It’s also helpful to make this shopping trip solely about your child and their potty training plan to make it extra special. Let your child show off their new purchases to family members when they get home. Make potty time story time. Pick out special books that are only for the potty. Silly books of kids’ poetry, brightly illustrated picture books with easy-to-follow stories, and books that have funny words and rhythms are all great fun to read together while your child is waiting on the potty. These bathroom-only books will give your child something to look forward to when they have to go. You can even create you own book. Create a sticker chart. A reward system can work wonders for some kids – but keep it simple. Have your toddler create a sticker chart with you so you can describe how it works. You can use poster board as a base and let your child decorate it with crayons, markers or watercolors depending on their level of ability. Or, use one of the charts available right here on the site. Use pictures or stickers to show each reward – whether it is a favorite video, a treat, or an activity – and let your child place the sticker on the chart every time they successfully go. Don’t wait too long for the pay-off, however, as children at this age have a hard time understanding and working toward long-term goals. No matter what keeps your child excited and motivated to potty train, it’s important to keep the fun in the process and make this a bonding opportunity for both of you – one that sets the tone for your partnership for years to come. Know that your child will be potty trained eventually, and you’ll always have some very cute stories to tell.